The holiday season isn't just about turkey, stuffing, and cranberry sauce. It's also peak time for truffles. And few foods can make us swoon like these odd fungal tubers. Properly prepared, they might be the sexiest of all our ingredients, evoking even more intense longing than oysters or chocolate. But how many people in this country, even food-obsessed people, can say they've had a mind-blowing truffle experience? Part of the problem is that we don't have a truffle culture here in the U.S. comparable to the truffle cultures of France or Italy. Home cooks don't know how to shop for truffles or how to prepare them—and, sadly, neither do many restaurateurs, for that matter. 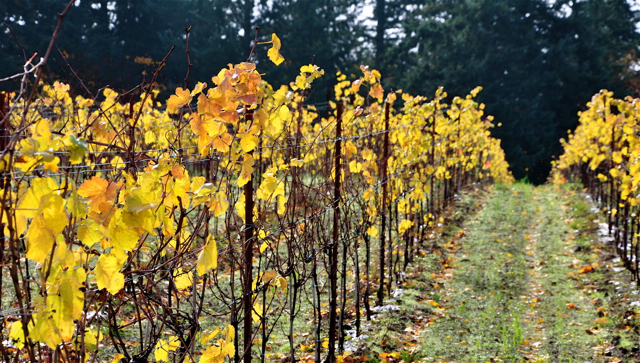 Next month I plan to attend the Oregon Truffle Festival, ground zero for the emerging homegrown truffle culture. The festival is in its seventh year and will feature an assortment of events, from meals and cooking demos to a forum for would-be truffle farmers. My friend Jack Czarnecki will be cooking up some serious truffle fare with his son Chris, chef-owner of Willamette Valley's famed Joel Palmer House. 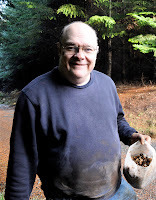 Other luminaries include Jim Trappe, one of the authors of the Field Guide to North American Truffles, Molly O'Neil, the former New York Times food columnist, and numerous guest chefs, including Josh Feathers of Tennessee's Blackberry Farm and Robin Jackson of the Sooke Harbour House in Sooke, B.C., among others. There's even a truffle dog-training seminar. A quick primer: truffles are ectomycorrhizal fungi that partner with certain species of trees (Douglas-firs for the edible varieties in the Pacific Northwest) in mutually beneficial relationships that involve the exchange of nutrients and water. The truffle's reproductive strategy is to produce a scent irresistible to certain mammals (e.g., voles, flying squirrels...and humans) that will hungrily dig up the truffle, eat it, and spread its spores. Describing truffles is no easy task. They're not much to look at. But, oh, that aroma... It's musky, sometimes fruity or garlicky, always earthy and, for lack of a better word, funky. Some would say it's an aroma more appropriate to a honeymoon suite than a dining room table. For those who want to forage their own, I'd recommend training your dog. I've foraged truffles with and without dogs and can report that my success rate went up exponentially with the hound. Sniffing out truffles is no problem for canine smellers, and generally the truffles will be of better quality, which is to say, riper. And therein lies the main problem facing our native truffle industry: too many unripe truffles are being foraged and sold to consumers who don't know any better. Case in point: A friend of mine bought a local black truffle at a Seattle market the other day and showed it to me proudly. She had big plans for the truffle. I took a whiff. Nothing. The truffle had absolutely no aroma whatsoever. "Take it back and demand a refund," I told her. She was crestfallen, her dinner plans thwarted. Be sure to examine your truffle before buying. It should be dry, firm, and pungent. Black truffles, to my nose, smell fruity, somewhat like overripe pineapple, with a distinctly fungal underpinning that is strange and beguiling. 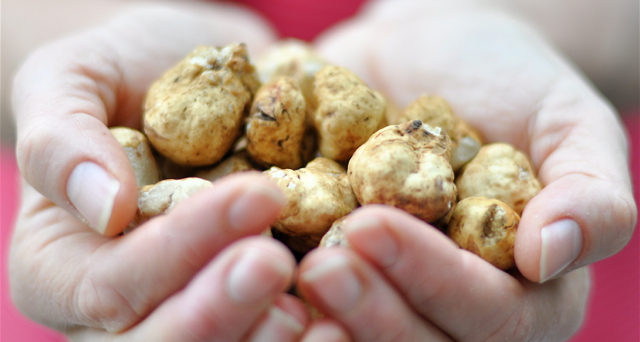 White truffles are more garlicky and can pack a wallop. Like other complex foods (e.g., wine, chocolate), the taste and aroma will vary for individual palates. Some people go to pieces in the presence of truffles, while others wonder why the fuss. Once your truffle is conveyed safely home you'll need to take precautions in serving it. Slice it thinly over hot food. A little goes a long way. Simply shaved over buttered pasta is a classic way to enjoy the singular essence of truffles. The heat of the pasta reacts with the truffle and the fat in the butter serves to absorb the flavor. Prolonged cooking, on the other hand, will destroy the delicate molecular design of its scent. I don't understand recipes that call for inserting slivers of truffle in a piece of meat before roasting. The cooking process will likely obliterate the truffle flavor—but perhaps there are ways to pull off such a feat. I'll be sure to report back on what I learn about cooking with truffles at the Oregon Truffle Festival. I would love to attend this next time we are in Oregon. Our friend Jim Bower who passed away this past year..spoke highly of the festival. Dawn - I'll make sure to post after the event with a low-down. Ruth - It was a poor year for matsutake and porcini in the mountains. Better on the coast but not great. HI, I have a dog, trained at the truffle-fest a couple of years ago, but I need a ripe truffle to refresh him. Do you know where I might find one or three? I'd like one or two of each different kind of truffle we have around the Pacific NW. Any recommendations for good places to source truffles... for those of us who live too far from the source to forage? Farmer Lady & Lo - Try Foraged and Found Edibles in Seattle.